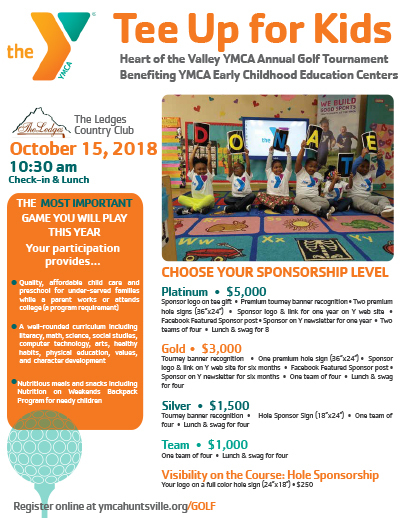 HUNTSVILLE, AL (August 16, 2018) - The Ledges Country Club will once again host the annual YMCA Tee Up for Kids Golf Tournament to benefit Early Childhood Education, now in its ninth year. The tournament is set for October 15 beginning with check-in and lunch at 10:30 a.m. An afternoon tee time of 12 p.m. allows players the morning to take care of business at the office, then enjoy fun and fellowship on the course following a catered lunch. Money raised through the tournament will help pay for tuition assistance needed by 90% of the 229 families served at three centers in northwest, downtown and southeast Huntsville. The YMCA subsidizes the cost of quality, state-licensed child care and preschool for households headed mostly by single parents struggling to work or go to school while raising young families. Steven Cutter and Ryan Renaud, members of the YMCA Early Childhood Education Board of Managers, are co-chairmen of the tournament. Redstone Federal Credit Union and Bryant Bank are Gold Sponsors. Sponsorships at a variety of levels are available and include recognition in Y branches for one year, team play and other amenitites. Hole sponsorships provide visibility on the course to all teams.